It's been an eventful few days. Friday morning I heard some disappointing news regarding completion of the engine swap. Suffice it to say, I was done. That same afternoon a gent (Butch of Home trucking) asked if I could be ready to go on Monday. I said "yes" with no idea how to accomplish a removal in such a short time. No the engine is not done. However if you say yes, good things often do happen. I'm firmly convinced my angels were working overtime. I said Yes to Butch and then had to figure out how to make it all happen ASAP. Saturday I went by the post office and said good-bye to my friend Miss Connie from the Carrabelle Post Office. She is a real gem. Too, on Saturday a local drove me over to East Point (1/2 hour west) to a couple of auto places. Finally at an auto glass shop was able to obtain butyl for the fan-tastic vent fan I'd partially installed in the overhead. Lacking butyl, I could not do the tightening down of the unit. I did that Saturday evening. And it leaks -- but I'll fix that. Also on Saturday website visitors had contacted me. They were appraised of the situation and offered to use their jet-ski to tow me across the river to the boatyard. Because I did not want confrontation and knowing the business owner often came in on Sunday's from ten until noon, I asked for a tow at noon. Right on the mark, Freddie and his Heather arrived. We succeeded in moving Seaweed and had a lovely lunch at The Fisherman's Wife restaurant. That's the second time in two years (first year was Beast followed by BOB engine replacement) that I'd eaten in that restaurant. And I had not had a hot dog for literally years. Because I get tired of them too soon to buy a pound package, I seldom do so. Of course yesterday I remembered that since I can meats I could pressure cook/preserve the leftover hot dogs from a package. I'll do that soon too. I just had not considered canning which is odd since I can lots of meats. Anyway, Fisherman's Wife is a good place to eat. It is economical. The French fries are good and the hot dog was okay. Not burnt, however if I've heard one person say they burn hot dogs, I've heard it a dozen times. Talk is talk. And hot dogs need to be burnt. Maybe Mother never cooked 'em right or shoving them on a stick over an open fire got me used to burnt ones... in any event, Fisherman's Wife doesn't burn 'em. I still have hope that eventually I'll get a burnt hotdog, though I'll probably have to do it myself. Anyway, late Sunday night the driver arrived and we were all ready to go at 0800 Monday morning. Of course it was a bit of an ordeal to get Seaweed on the trailer. The truck driver was a real pro -- and very particular as to placement, leveling, etc. He'd been to Texas, and was supposed to pick up a 32 Nordic in Alabama but something went wrong. Instead he was able to fit me in -- I was fortunate. Because loading took quite some time, and Butch could not possibly get to the launch marina in St. Pete on Monday before they went home for the night we took a slow trip south. No need to go seventy and waste fuel, eh? Anyway, we ended up launching Tuesday morning. Now I'm safe, secure and in St. Pete. Of course I still have to have a mechanic finish the job. Two individuals, Freddie (jet-ski driver) and another back in Carrabelle, both looked at the engine set-up and declared it would take just four hours to be done. I still have to do that -- but not this month. Moving was good -- glad it's over and can't thank y'all enough. There is a big difference between Carrabelle and St. Pete. There, being put on the trailer was $75 at Dockside Marina. Here, to get off which is by far the easier task, was $230. Ouch. Still, I'm very glad for those that use my Amazon links. Those help enormously and will catch me back up. I'm relieved to have the Carrabelle years over. I came to that town a stranger and met some good people. Kim at C-Quarters is a gem. Her Harold is too. He does marine electronics, integrating radar, autopilots, navigation systems, etc. And Harold delivers boats. Well, some out-and-out deliveries but also folks who are a bit trepidatious about crossing the Gulf of Mexico... Well, he'll go with and run the boat. Because it is open water some wives and husbands chose to rent a car and take the scenic drive around the coast. Then they meet their boat the next day south safe and sound. That works well for all. Basically, from here south (well, Tarpon Springs which is a bit north of St. Pete) it's all ICW. Protected, and beautiful green water. I tell you, I cannot wait to get my Seaweed running again. But not this week. This week I'm going to inhale deeply and recover. It's been a bit nerve-wracking. I'll miss my old friends and look forward to having a boat that actually moves under her own steam. Thank you to everyone who helped make this move possible. I'd still be in Carrabelle were it not for the many kindnesses shown me. It is appreciated. Very very much. And now you know where I am. As for the website, I've got some articles to go up before the official "I'm in St. Pete" appears. I'm here though and wanted you to be the first to know. Janice aboard Seaweed in St. Pete! Glad you made it to St. Pete safe and sound, Janice. It all sounds stressful. However, as you say, some real down home folks in Carrabelle. One of my favorite places. Congratulations on the Carrabelle nightmare being over. It has been ten months since your Kubota diesel was delivered to you and your mechanic there and it is unconscionable of him to STILL not have completed installation, a job that should have taken no more than a couple of weeks (if that). Your new life has begun and you will find St. Petersburg and points south to have wonderful cruising. Good luck and please keep us updated on your progress. Thanks to you both John and oldhatt. I appreciate everything and look forward to using my boat again as she's intended. This week I intend to relax, and rejuvenate myself. Yes, there is the Project Management aspect which failed miserably. I'll be an example of what not to do. I let it go far too long and am looking forward to the motor again running as she should. Looking in the rear view mirror (my mistakes) isn't good for my happiness quotient. I'm facing forward and hoping for only good things. And an engine purring along. That would be nice too. The waters here are green, and fish are plentiful. Tonight I'm having flounder. It was swimming this afternoon. And nope, it wasn't me that caught it. Fish do not fear me. A neighbor down the road was selling fish already fileted. Who could resist that?!? I've got to hand it to you Janice. Don't worry about Seaweed sinking. You are the original unsinkable. Now, you have reached paradise in cruising. You are right to slow down. Soak it in. It's all good from here. We're not so different, Janice. My projects take forever. Glad to know you're in St. Pete and in striking distance. Wish I could just fix it all. See you soon. I hope it all comes together for you and Seaweed. Maybe a change of location, and a change of mechanic, will bring a new fresh mind to the job. Here`s hoping. Life is good here. A mechanic was scheduled to come by yesterday but weather was atrocious. He'll come by one day next week. I'm anxious to hear what he has to say. I've been following your posts and blogs. St. Petersburg is my home port and stomping grounds. I regularly cruise from St. Petersburg to Tarpon Springs--so many places to go/anchor and the ICW in this area makes for some great cruising. Tons to see and do in the area...ENJOY! Thanks Vashon and Off... I do look forward to being able to do some exploration. I tend to not go far and then anchor up for a day or five. I can't wait to explore some of the bays I've seen on the charts. It's going to be fun to be mobile again. Well, it's great to have you here! There are some great little islands and sand bars to explore, restaurants and marinas, just between Long Boat and Crystal River. So many bays and inlets, with teaming with wildlife. Yep, it's a cool area to be. Venture a little south and you've got the Lee County Coast. Again a beautiful place to visit, with Captiva, Pine Island, and Cabbage Key all right there together. Off Duty has named some great places. I am particularly fond of Three-Rooker Bar, which is located just south of Anclote Island and North of Honeymoon Island. I've been visiting Three-Rooker since the early 80s. 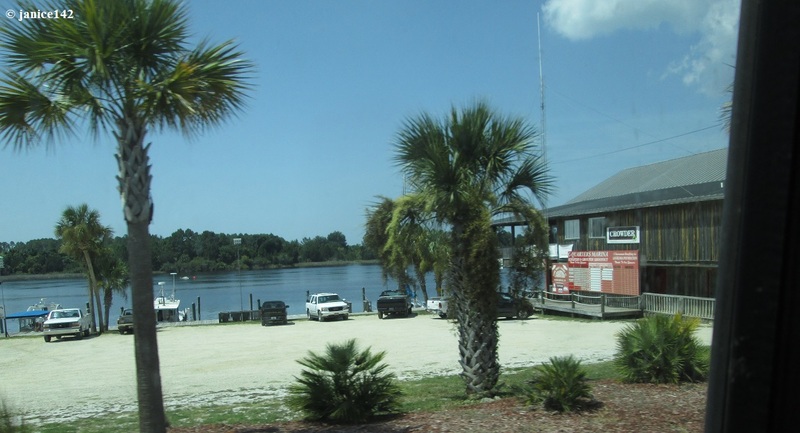 It offers great swimming, beautiful sunsets, and great shelling on the island's west side. Thanks so much gents. I look forward to progress. And you're correct: the waters are beautiful. My only trouble will be deciding where to go first. And second, third, etc. The mechanic of the 18th let me down. First he had a job in the Bahamas and then one on the Mississippi. I suspect (know to be true) my job is just too small of potatoes to interest him. Project management kicked in and yesterday I hired another mechanic. He's scheduled for the next couple of weeks but I'm on his To-Do list. This one, from my understanding, does keep his schedule of people/machinery. If I'm third, I'll be third. One and two might take longer but I won't be shoved back repeatedly to fourth, fifth, whatever. I'm looking forward to having a boat that is mobile again. And in the meantime I'm redoing the galley. A website regular gifted me a refrigerator/freezer. It's the 3.2 cf Haier with the separate freezer door. A friend over on the east coast has one in his 40' steel sailboat. He says the freezer works for ice-cream. Mine, in my Haier cube didn't make icecubes well. But what's best of all is that I'll be able t put a whole cantaloupe in the reefer without chopping it up. Ditto lettuce. I know it's semi-crazy to go to this effort for a cantaloupe but I really REALLY love cantaloupe. And lettuce. Diets and all that stuff. When stuff bothers me I don't eat healthy good-for-me foods. Unless animal cracker cookies are considered meat because they are shaped like animals?!? Nope. Probably not. And I weighed myself today. The same as when I was nine-months preggers with Son. I'm on a diet. Sigh. Life in St. Pete is wonderful. I've been doing canning -- made taco soup last week and making more tomorrow. You have stores here. It's fun to see green water. I do so look forward to going to a couple of places I've not yet visited. One is Don's Salvage. I heard it was huge. The other, Pinellas Fasteners, has everything fastener. I'd like to get some eye bolts (bolts not screws) in size 6 about an inch long. Bunches will be used on a couple of projects -- one on the foredeck and the other in my cockpit. Skipper is enjoying the area too, though she misses her friend in the Carrabelle post office (Miss Connie) and Kim over at C-Quarters. Plus James at the marina used to give her beef jerky sticks sometimes. Those were favorites. Mostly though I wanted y'all to know how glad I am to have a fresh start here in St. Pete. I'm not going to let this Project get beyond me. My determination to complete the job without a lot of hullabaloo is strong. And in the meantime I'm making Seaweed better, and fixing what breaks. There's always something, eh? Tomorrow I'm headed for Harbor Freight for a $13 drill with 20% off, so for $10 I'll have a nice drill. Mine finally gave up the ghost and I've wanted a replacement -- but not a $$ one. A few upcoming projects require screwing and the drill will help. That's it from here. Thank you for everything. I'm happy. Just yesterday I was perusing the boards, and thought 'hey, where's Janice? Haven't heard from her lately..."
Your ears must have been ringing. Glad all is well! Life is great. It's a fresh start and the mechanic is hired. Second one. In the meantime I'm completing projects and doing a lot of canning. And writing. It's good to be south. Well it's good to have you here lady! I'm in and out of St. Pete all the time (was there again today at the P.D. ), and right across the bridge. Be happy to help out with whatever.